Syrian pro-government media reported that nine civilians have been killed by shells fired from rebel areas south of the province of Idlib on a government-held town. Syria state news agency SANA said they were killed when the missiles struck into a residential area in Mhardeh town in the northern countryside of Hama. Hama lies to the south of Idlib, and several of its villages and towns remain under rebel control. Warplanes, including suspected Russian ones, hit rebel areas in northern and southern Idlib earlier Friday, killing at least five, including one civilian, according to the Britain-based Syrian Observatory for Human Rights. The violence comes on the day that the presidents of Iran, Turkey and Russia are meeting to discuss the fate of the last rebel stronghold in Idlib and surrounding areas in Hama. The director of U.N. humanitarian operations is warning that if a military offensive takes place in Idlib and millions of people start fleeing, aid operations to help them will be overwhelmed. John Ging told the U.N. Security Council on Friday this worst-case scenario “has the potential to create a humanitarian emergency at a scale not yet seen through this crisis,” now in its eighth year. He urged council members to ask the parties to cease hostilities in the Idlib de-escalation zone which includes parts of Idlib, Aleppo, Latakia and Hama governorates and includes some 3 million people, about 2.1 million already in need of humanitarian aid. Ging also called for protection of civilians, humanitarian and medical personnel, hospitals, schools and other infrastructure as well as freedom for people to move, access for aid deliveries, and increased funding. Iran’s Supreme Leader Ayatollah Ali Khamenei has met Turkish President Recep Tayyip Erdogan on Friday after a trilateral meeting between Iran, Russia and Turkey to discuss the war in Syria. “America is concerned about the cooperation of Islamic countries and the formation of an Islamic authority,” Khamenei was quoted as saying. Khamenei added that this fear underlies America’s hostility toward Islamic countries, according to the report. The U.S. ambassador to the U.N. is warning Syria and its allies Russia and Iran that “the consequences will be dire” for an assault on the last major stronghold for Syrian rebels in Idlib. Nikki Haley told the U.N. Security Council on Friday that an offensive against Idlib is starting despite warnings from President Donald Trump and other world leaders, including Russian and Syrian airstrikes against civilian areas. “The United States has been very clear, with Russia and with the broader international community: we consider any assault on Idlib to be a dangerous escalation of the conflict in Syria,” Haley said. “If (Syrian President Bashar) Assad, Russia, and Iran continue, the consequences will be dire,” she said. Eight aid agencies have called on world leaders to prevent a humanitarian catastrophe in Syria’s northwestern Idlib province, where the Syrian government is threatening a military offensive. The agencies called on leaders of the Iran, Russia and Turkey meeting in Tehran and members of the U.N. Security Council meeting later in New York to work together to find a diplomatic solution that can protect civilians, aid workers and allow access to humanitarian agencies to the overcrowded province and surrounding areas. More than 3 million live in Idlib and its environs, many of them already displaced by conflict elsewhere in Syria. The agencies, including CARE, Mercy Corps and the International Rescue Committee, said the “most vulnerable” are likely to pay the heaviest price in case of an offensive. They said aid workers working in Idlib are already overwhelmed trying to provide basic needs and shelter to the province’s population, which has doubled in size in recent months because it is hosting displaced citizens from all over Syria. He told the U.N. Security Council Friday that talk of a military offensive on Idlib “is happening at exactly the same time when there is serious talk” on moving to establish a committee to draft a new Syrian constitution and encourage the return of Syrian refugees. De Mistura said these are incompatible. It would be a failure of diplomacy “if with these efforts we simply saw an increase of military activities,” De Mistura said. Turkey’s president says his country does not have the “strength or capability” to host millions of more refugees from Idlib. Recep Tayyip Erdogan said Friday that a call for terror groups in Idlib to lay down arms was a strong message to them and would help halt refugee flows. “We have to take joint steps to prevent the migration, we need to be successful in the fight against terrorism,” Erdogan said. “Turkey is already sheltering 3 ½ million refugees (from Syria). The population of Idlib is 3 ½ million. Turkey doesn’t have the strength or capability to host 3 ½ million more,” he added. Russian President Vladimir Putin says it is “unacceptable” to use civilians as a pretext to shield “terrorists” in Syria’s rebel-held Idlib. 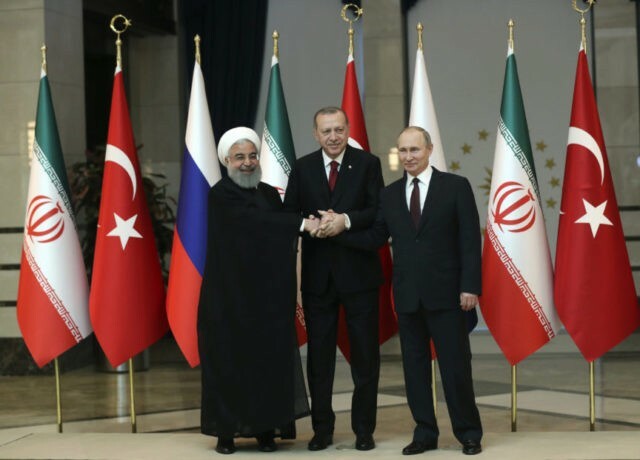 Speaking at the end of a trilateral summit with the leaders of Iran and Turkey Putin said Russia is worried about civilians in Idlib but said Russian finds it “unacceptable” when civilians are used a pretext to “shield terrorists” and target Syrian government positions. Turkey’s president is calling for a cease-fire and an end to airstrikes amid a looming campaign for Syria’s Idlib province. Friday’s summit may determine whether diplomacy halts any military action ahead of an anticipated offensive targeting the northwestern Syrian province. Iranian President Hassan Rouhani says the fight in Syria should continue until all extremists are “uprooted,” especially in Idlib. Iranian President Hassan Rouhani says America’s intervention in Syria should immediately end. Residents in Syria’s northwestern Idlib province are holding mass rallies in the rebels’ last bastion, protesting an imminent government offensive there and chanting against the country’s ruler President Bashar Assad. The Friday rallies came as Presidents of Iran, Turkey and Russia are meeting in Tehran to discuss the war in Syria. The summit may determine whether diplomacy halts any military action in Idlib and its surrounding areas, home to more than 3 million people. Nearly half of the area’s residents are already displaced from other parts of Syria and have refused to reconcile with the Syrian government. The area also includes opposition fighters and some of Syria’s most radical groups. Al-Mustafa said his rebel alliance is looking to Turkey’s efforts to prevent the attack and “to protect Idlib.” Turkey has deployed 12 observations points and hundreds of fighters that ring Idlib, separating them from government and allied fighters, as part of a de-escalation agreement with Russia and Iran. The summit may determine whether diplomacy halts any military action ahead of an anticipated offensive targeting Syria’s northwestern Idlib province. Activists and residents say warplanes have struck areas on the southern edge of the Syrian Idlib province, the rebels’ last bastion, killing one and causing loud explosions and large plumes of smoke. Ghasemi wrote: “The summit has double significance since all the three nations have faced ambitions and greediness of an illogical international big power.” That refers to the United States, which has some 2,000 troops in Syria after its war against the Islamic State group. The summit Friday between Iranian President Hassan Rouhani, Russian President Vladimir Putin and Turkish President Recep Tayyip Erdogan may determine whether diplomacy halts any military action ahead of an anticipated offensive targeting Syria’s northwestern Idlib province.